People start network marketing ventures every day, and join their new businesses with all the verve of a quarter horse bounding around in the starting blocks. Why, then, do most people never achieve their goals? 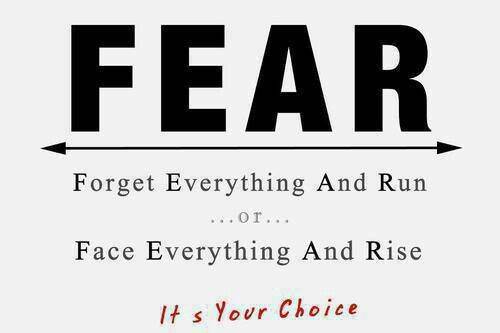 Well, there are many answers to that question, but one – most certainly – is fear. What, exactly, do we fear? Again, probably lots of answers. Yesterday morning the family and I drove to a small street fair in our local town green. My youngest daughter was to play “The Bells of Great Britain” on piano, from the gazebo, as part of an expo her music school was performing. As we waited Cassidy’s turn, an eleven-year-old girl took the stage first with an electric guitar, accompanied by her teacher on the bass. The adult audience of maybe 20 to 30, mostly passers by who stopped out of curiosity, looked on as this little girl started a slow, melodic, Metallica riff. As she stared at the strings, never looking up, her tiny chest heaving, it became apparent to me that this little girl may hyperventilate. Suddenly she just stopped playing. She glanced at the teacher, then back down at the guitar. Silence. A sympathetic ovation rose from the crowd – our hearts breaking – as though we could will her the strength to keep going. She started over. Red faced, but determined, she played again. Still staring down at the strings, tears rolled down her cheeks and onto the electric guitar but the music got stronger. She was amazing! The girl came down the stairs of that big round gazebo to a “relieved” ovation by people who were more impressed by the courage than the actual performance which, again, was great. I couldn’t stop thinking about that little girl’s self-induced fear and how badly every single person there wanted her to succeed. Maybe its time to think about how this might apply to you. Maybe you should push through your silly fear too, and maybe you too can experience the thrill of that ovation which is certain to follow. Incidentally, my daughter was up next and was also nervous.